What makes this beer different: The best yeti of the oak aged series for sure. Will I be drinking this again: Yup my buddy Kevin got me 4 bottles right from the tap-room in Denver. 12/20/2010: Earlier in the year I rounded up all four of the Aged Yeti’s, and this was the last of the oak aged series that I have yet to try. Chocolate and Oak were both very good, but I tend to really like the coffee centered stouts so I am willing to bet this will be my new favorite. The nose of Espresso Yeti smells as advertised, very Espresso heavy. The flavor is just awesome, rich, roasty, oaky, bittersweet chocolate, and of course a lot of espresso. What I like about the espresso flavor is it isn’t “burnt” like a lot of other coffee flavored beers. I am assuming the beans were possibly steeped and not actually brewed? Would be interested to know. The beer has a great heavy creamy mouthfeel, and finishes a bit dry. Surprisingly drinkable considering how heavy it is. If you are a coffee lover give this one a shot, you will probably love it! Picture of the day: This is why you don’t leave your kids unsupervised. What makes this beer different: First stout that I could actually taste chili’s in. But it works well! Will I be drinking this again: Yes I have a couple aging in the basement. 7/28/2010: Earlier this year I made a post asking for feedback on how to sample all four aged yeti’s, but up until today I have yet to try any of them. I also wanted an excuse to go to fatheads to try their headhunter IPA, which was also amazing. I will go back down to drink it on its own soon so I can do a detailed review on it. Chocolate Yeti is a very complex beer. The smell is full of roasted malt, and some bitter chocolate. The flavor starts with bitter bitter chocolate, sweet vanilla, some woody oak, and finishes off with a little bit of dry chili pepper flavor. Its a roller coaster of flavors with crazy twists and turns, but when the ride is over you are really glad you were on board. Medium mouthfeel, with only a little bit of carbonation. This really makes me want to crack open the other three yetis sometime soon (espresso, oak, and barrel aged). Try this beer if you get the chance! 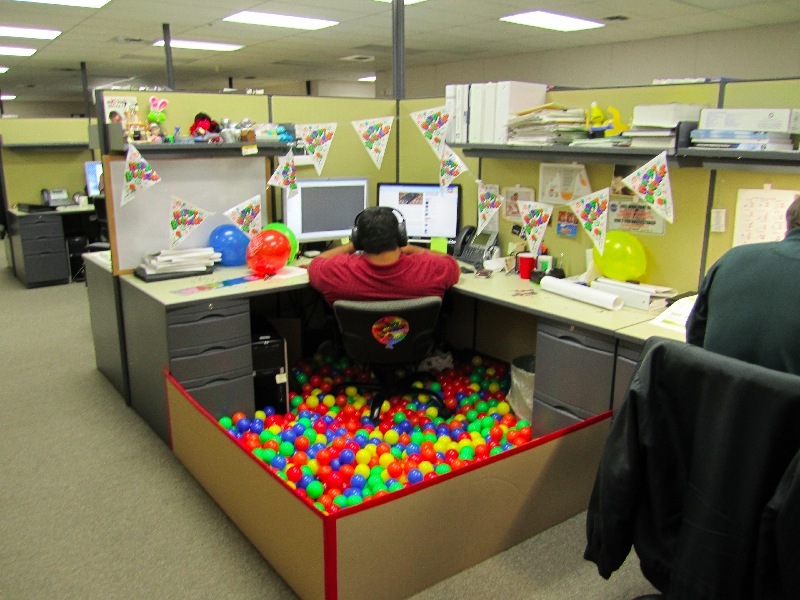 Picture of the day: Best cubicle ever. What makes this beer different: Not much, but just a very good Porter. Will I be drinking this again: Apparently they are retiring this beer? 5/20/2010: Yet another Great Divide beer. This time My tall ginger friend Kevin was not responsible for me getting this beer. I bought it at Vintage Estate last week. I also ended up finding some 2008 Stone RIS, and 2002 12th Anniversary Stone Bitter Chocolate Oatmeal Stout on his shelves. I couldn’t help myself and ended up buying about a half dozen of each. Its a shame they are retiring this beer because I think its pretty damn good. It smells like a light roasted coffee, with some caramel splashed in. The taste is a very smooth roast coffee flavor, and hops actually make a little bit of an appearance also. Mouthfeel is medium, but very smooth, and perfectly carbonated. Grab up a couple before they retire it for good! Picture of the day: 6 eipc wheel of fortune fails. Purchased at: I have had this bottle sitting in my beer fridge for almost two years, from a mixed case. No idea where I bought it. What makes this beer different: Its not often you age a Pale Ale, but it was pretty tasty this way. Will I be drinking this again: Yes I would like to try one fresh. 5/13/2010: Am I the only one who likes an “old” Pale Ale? This is the second one I have tried out of the 185 previous beers (Hitachino Classic Ale was the other). You technically aren’t supposed to age Pale Ales, but for some reason I like the taste. Kind of like a good aged bleu cheese. Odd I know. Denver Pale Ale has that “old” ale smell to it, can’t really put it into words. Smells musty like an old tent, or maybe an attic? After two years there is no hop presense to be found, only caramel malts, and some grassy characteristics. It finishes a bit dry. The one thing I love about this beer though is its thick and creamy mouthfeel for a Pale Ale. Very heavy for the style, but I like thick beers so it works. Anyone have an aged pale ale that they ended up liking? Picture of the day: Gender Confusion seems to be a growing problem. Purchased at: Giant Ginger Kevin from Colorado brought this to me right from the brewery. 4/27/2010: So I know that technically you aren’t supposed to drink this style of beer from this glass, but it was new and it matched the brewery so I had to. Thanks to Kevin for bringing the beer/glass back from the brewery for me, this might be my new favorite glass. Colette is pretty funky smelling, sour and lemon also. I tried this and for some reason this instantly reminded me of a sour Franziskaner. I made my franzy loving roommate try it and without telling him what it tasted like, and he said the same exact thing “Tastes like a sour Franzy.” There is also a bit of hops going on here along with the yeasty citrus flavors. Over average carbonation but I think it works here. Also I would never peg this at a 7.3% ABV beer, hides it very well. Picture of the day: Wow how true is this. 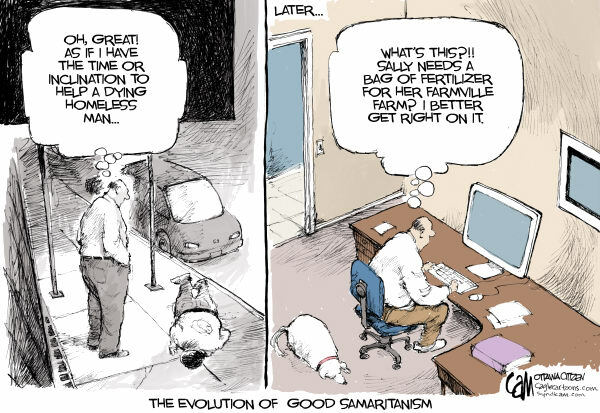 The Evolution of Good Samaritanism . 2/20/2010: So I am on a new mission to try as many of the top 100 beers on beeradvocate.com as possible. A good bit of them are fairly accessible, and reasonably priced, so I figure why not? Old Ruffian drops in at #87/100. I am by no means a barleywine expert, so take this review with a grain of .. barley? One thing I can tell you is there was a pretty big hop presence to Old Ruffian, especially for the style. The smell is violent, very hoppy, caramel, and booze. The best way I can describe the taste is its a three headed monster of caramel malt, citrus hops and alcohol, but they are all in balance. The beer without a doubt got better as it warmed. Much more flavorful and balanced when it got closer to the 55 degree range. I still need to work on truly appreciating barleywines, but this was for sure one of the better ones I have had. Picture of the day: Sometimes beer goggles make you laugh, but this would just make me want to cry. 11/22/09: Finally decided to stop being lazy and take pictures of the beer and bottle, and this was a good one to start on. This one was pretty hard to find. Tons of different flavors going on in this one, but they all balance well. Hops, sweetness, coffee all rolled into one. My only complaint with old ales in general is they usually are under carbonated. Overall a very good beer. Will I be drinking this again: If I can find it again! 11/19/09: This beer was about as hard to track down as a real Sasquatch. But wow it was worth the wait. This really seems like a tamer version of AleSmith Speedway Stout to me. Pours out like black tar and much thicker than your average stout, but not as chewy as speedway. The flavor on this one is real good, and it hides the 9.5% alcohol nicely. Tastes like chocolate covered espresso beans.